Click on photos for larger detail. IMPORTANT CASE & BULK SHIPPING INFO! Hand made and wrapped, made fresh to order. 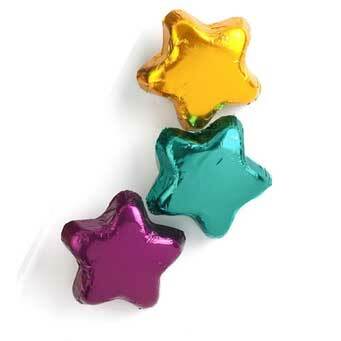 Available in any color foil. Available in white, milk or dark chocolate in favor bags tied with ribbon, 8 pc gift box tied with ribbon or bulk 1 pound box. Approx. 60 pcs. lb. 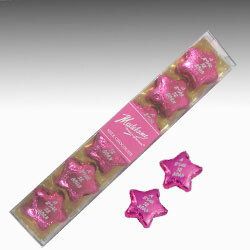 Milk chocolate stars in colorful foil wrappers. 1 1/2 x 1 1/2 x 1/2, Approx. 48 pcs. per pound. Kosher OUD. Available by the 10 lb case, 5 pound bulk, 1 and 1/2 pound bags. Dark chocolate is available further below. IMPORTANT CASE & BULK SHIPPING INFO! 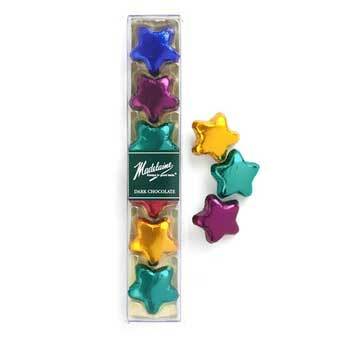 Dark chocolate stars in colorful foil wrappers. 1 1/2 x 1 1/2 x 1/2, approx. 48 pcs. per pound. 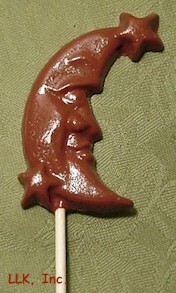 Dark chocolate are only available in multi colors. Colors are actually a little darker than pictured. Available by the 10 lb case, 5 pound bulk and 1 lb bag. Gift sticks are 7 pcs. 2 oz./24 boxes per case. Kosher OUD. IMPORTANT CASE & BULK SHIPPING INFO! 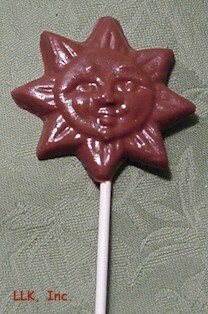 Big Star Lollipop - $3.75 ea. 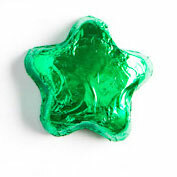 1.6 ounces, clear poly bag, tied with ribbon. Approx. 4.75 x 8.25 in with stick. 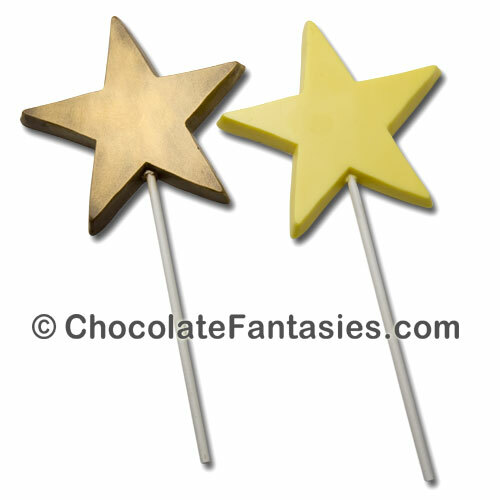 On left is milk chocolate with gold dust, on right is yellow white chocolate. 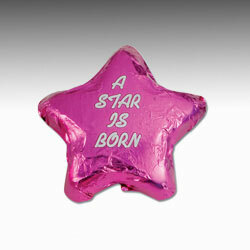 1.2 ounces, clear poly bag, tied with ribbon. Approx. 2.5". 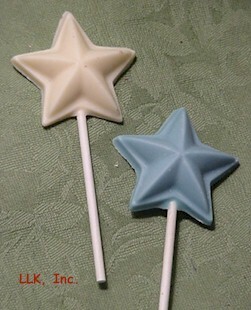 Star Lollipop - $2.25 ea. .8 ounce, clear poly bag, tied with ribbon. Approx. 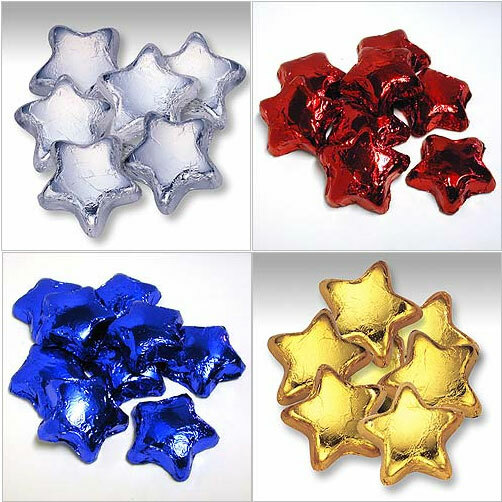 2.5"
Chocolate Stars - $2.50 ea. 1.1 ounces, clear poly bag, tied with ribbon. Approx. 3". 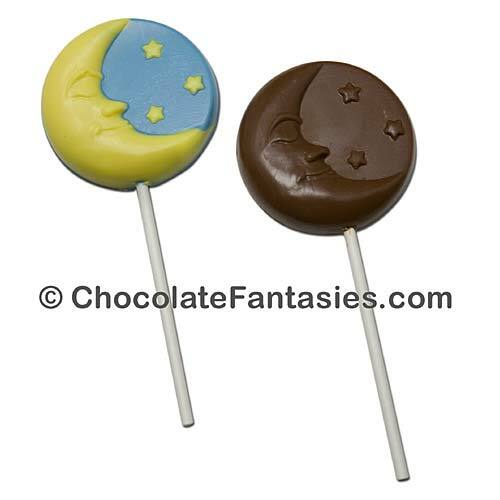 On left is blue white chocolate, on right is milk chocolate. Available gold dusted or plain in singles or bulk boxed. Approx. 16 pcs per pound box. 1.3 ounces, clear poly bag, tied with ribbon. Approx 4"
1.1 ounces, clear poly bag, tied with ribbon. Approx 2.5". Available in one or two color. 1.3 ounces, clear poly bag, tied with ribbon. Approx. 4". 1.3 ounces, clear poly bag, tied with ribbon. Approx 2.75"
3 ounces, gift boxed, tied with with stretch ribbon. 1 ounce, clear poly bag, tied with ribbon. Approx. 3". 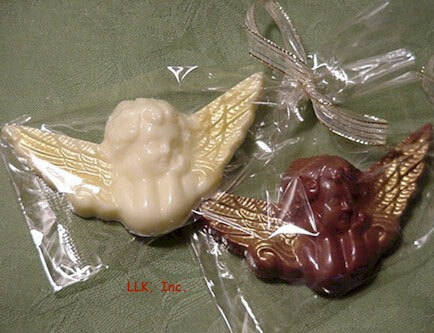 Large Angel with Golden Wings- $3.75 ea. 1.5 ounces, clear poly bag, tied with ribbon. Approx. 4". 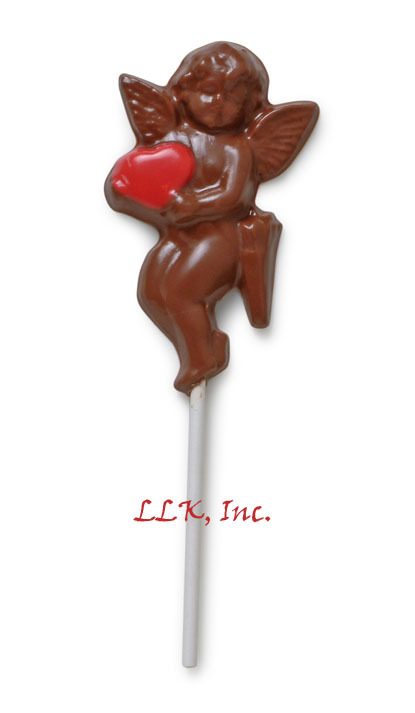 Cupid with Heart Lollipop - $3.25 ea. 1.5 ounces, poly bag, tied with ribbon. Approx. 4.25". 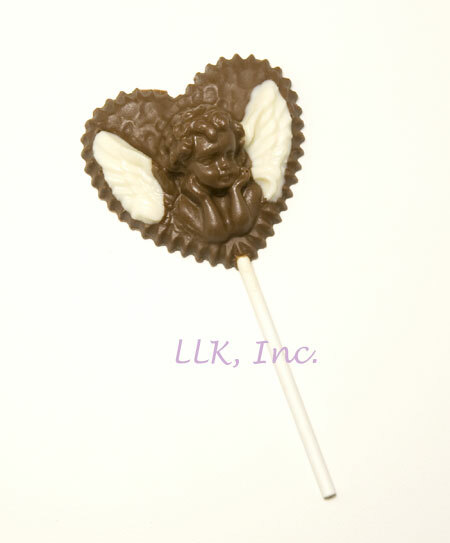 A highly detailed angel in a designer heart with alternating color wings. Poly bag, tied with ribbon, 1.5 oz. 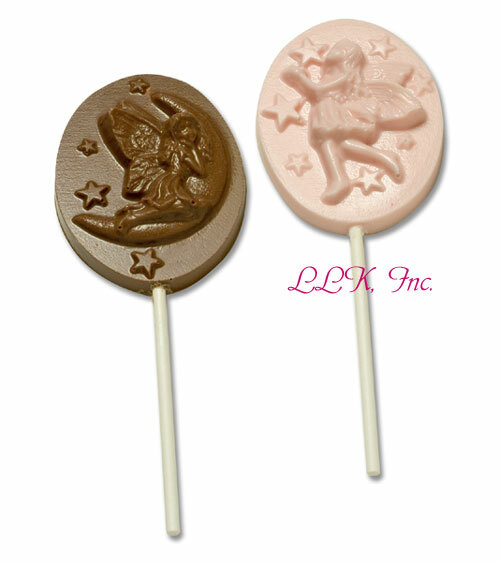 Chocolate Fairy Lollipop - $3.20 ea. 1.5 ounce, Cello Bag, Tied with Ribbon, available in four different fairies, let us choose for you. Click on the feathers for a selection of beautiful chocolate feathers.